The fourth Microsoft Research Summer School was held at Microsoft Research in Cambridge, U.K., on 29 June through 3 July 2009. It included a series of talks of academic interest and poster sessions that gave invited students the opportunity to present their work to Microsoft researchers and a number of Cambridge academics. Invited students included PhD students at the end of their first year from the Cambridge University Computer Laboratory and Engineering Department, from the International Max Planck Research Schools for Computer Science, from the BSC– Microsoft Research Centre at Barcelona Supercomputing Centre and all the Microsoft Research 2008 PhD Scholars. Lectures and posters sessions were public and open to all research staff and students from the University of Cambridge. Writing papers and giving talks are key skills for any researcher, but they aren’t easy. In this pair of presentations, I’ll describe simple guidelines that I follow for writing papers and giving talks, which I think may be useful to you too. I don’t have all the answers – far from it – and I hope that the presentation will evolve into a discussion in which you share your own insights, rather than a lecture. Developing a precise, quantitative, predictive science of complex natural systems looms as the most active, important branch of science this century. Such a science is vital to understanding the biosphere, climate change, future food and water security, and the threat of a global pandemic, and that science could underpin a revolution in our understanding of living systems, medicine, and health. It will require new kinds of scientists to develop a new kind of natural science, and both will depend critically on radically new kinds of computational methods and tools to enable scientists to build and test dynamic, predictive models of complex natural systems, integrate them with data and experiments, and publish and share models, data, and results. This, in turn, demands new kinds of software environments to support this new kind of computational science, led by new kinds of computational scientists. A unique collaboration between scientists and software engineers in Microsoft Research’s Computational Science Group in Cambridge is pioneering the development of these new software environments. This talk will give a short introduction into the research on tools & technologies for new kinds of science we conduct. When labelled training data is plentiful, discriminative techniques are widely used since they give excellent classification results. However, hand-labelling of data can get expensive, and there is considerable interest in semi-supervised techniques based on generative models. Although the generalisation performance of generative models can often be improved by `training them discriminatively’, they can then no longer make use of unlabelled data. In an attempt to exploit the benefits of both generative and discriminative approaches, methods have been proposed which interpolate between these two extremes by taking a convex combination of the generative and discriminative objective functions. In this article, we consider that there is only one correct way to train a given model, and that a `discriminatively trained’ generative model is fundamentally a new model. From this viewpoint, generative and discriminative models correspond to specific choices for the prior over parameters, which opens the door to principled ways of interpolating between generative and discriminative extremes through alternative choices of prior. We illustrate this framework on semi- supervised learning. Recent progress in electronic, display and sensing technologies makes possible a future with omnipresent, arbitrarily large interactive display surfaces. Nonetheless, current methods of designing display systems with multi-touch sensitivity do not scale. This talk gives an overview of the limitations of existing display systems and briefly presents the key findings of my PhD research – a platform for resolving forthcoming scalability limitations by employing a distributed architecture. Humans excel at the task of image understanding. When we see a face we immediately infer if the person is male or female, attractive or not, young or old, hostile or friendly or just a boring speaker. For computers this is much harder, but some progress has been made. In this talk I’ll argue that for image understanding strong prior knowledge is needed. Humans have aquired this knowledge over the course of their phylogenesis and ontogenesis, while we are still very much trying to force-feed computers by hand. I’ll introduce you to generative face models to be used as prior knowledge, and I’ll demonstrate a range of different uses of these models which I’ve encountered during my thesis. I hope to give you an overview of the state of the art such that you know the possibilities and limitations of generative face models for image understanding. Matting aims to accurately extract a foreground object out of a photograph or video and is an important operation in many image/video editing applications. For instance, once an object has been extracted successfully from its background by appropriate matting techniques, it may be inserted into another scene. I will give an introduction to matting and discuss recent work in this area that was developed throughout my PhD studies in co-operation with Microsoft Research. More specifically, I will discuss different models for matting and present a ground truth dataset that can be used for a quantitative comparison of matting results. Refactorings are behaviour-preserving program transformations, typically for improving the structure of existing code and preparing the introduction of new functionality. A few of these refactorings have been mechanised in development environments, but many more have been proposed, and it would be desirable for programmers to script their own transformations. Correctly implementing such source-to-source transformations, however, is quite complex. In this talk, I will illustrate some common pitfalls in automating refactorings, show how to address them and how to facilitate the implementation of refactorings in general. Carlos Morais-Pires, project officer in INFSO Directorate F, Emerging Technologies and Infrastructures, will present an overview of the various EU programmes supporting young researchers and students in Europe. At some stage you might want to exploit your ideas by starting a company, just as Bill Gates and Paul Allen did in 1975. It might even be the next Microsoft, or bought by them. I’ll give an overview of the process, explain some of the success factors investors look for, and how to go about writing a business plan and getting off the ground. Some of the most promising research opportunities lie at the intersections of different fields. As a small step in this direction, Chris will give a short introductory tutorial to the field of machine learning. The focus will be on the underlying concepts, illustrated with simple examples, and the mathematical content will be kept to a minimum. This talk will assume no previous knowledge of machine learning. The Microsoft Research WorldWide Telescope (WWT) is a computational science innovation. It sets new standard for presenting (visualizing) large data sets. WWT enables a computer to function as a virtual telescope. It brings together the imagery from the best ground- and space-based telescopes in the world. It allows users to experience, interact, and create narrated tours to feature their favorite objects in the sky for astronomical research and science education. Through the WWT Academic Program, additional software tools are delivered to enable researchers and educators to integrate WWT with their existing astronomical research and science education platforms. I strongly believe in being able to use the right tool for the right job. The .NET platform has allowed me to achieve exactly that: I’ve chosen to write most of my own code in F#, a language which gives me the flexibility to code in a functional, imperative and object-oriented style. dnAnalytics, the open source numerical library I use from F#, is written in a mix of C# and C. Whenever I need to do rapid prototyping or glue together an experiment, I script it in either Python or F#. The key enabler is the .NET platform: it makes sure that all these languages understand each other. In my presentation I want to elaborate on dnAnalytics and how you can use it in your own research. dnAnalytics contains many essential tools for scientific computing: numerical linear algebra, special function evaluation, statistical tests, various distribution classes and much more. Using a short interactive demo I will highlight some of the key features of dnAnalytics. The research of the Cambridge Systems and Networking group at Microsoft Research Cambridge, covers the broad span of systems and networks research, ranging from improving the performance of individual computers through to designing novel distributed systems that can scale to hundreds of thousand of hosts. I will give an overview of this multi-disciplinary group that designs and builds systems, analyses them, and uses them. In this talk I will give an overview of recent research in the Microsoft Research Cambridge lab’s Sensors and Devices Group. I will cover projects such as SenseCam, a simple wearable camera which has spurred research in lifelogging and in supporting memory loss – e.g. for Alzheimer’s sufferers. I will also discuss Somniloquy, a platform enabling PCs to be put into power-saving modes more often without sacrificing functionality such as remote file transfers, by enabling them to “talk in their sleep”. I will describe Force Sensing, a way of augmenting mobile devices with pressure sensors to enable sensing of forces applied to the whole casing, e.g. twisting or bending actions, and interactions that this can enable. I will also show Second Light, a prototype surface computer which not only has an interactive surface, but which can also project images through the surface onto objects above it, and enable interaction above the surface. In recent years all parts of society – individuals, companies, governments – have become keenly aware of the need to conserve the environmental life support systems on which we all depend. When it is fully developed, ecology will enable this conservation, by providing reliable, accurate models to predict how alternative human actions would translate into outcomes at the ecosystem level, e.g. changes in biodiversity, carbon storage and water cycling. But ecology is a young science, unaccustomed – and some would say, not yet ready – to build these predictive models. In this talk I will present some examples of the computational ecology being carried out in our group. At least one project will be drawn from each of our research foci: ecological networks; next-generation Earth System science; biodiversity and biogeography; and behavioural dynamics. What these projects share is a methodology of combing pre-existing and new concepts and models with large amounts of data, and an aim of carrying out science that is both relevant to society, and packaged in way that can be understood and used by as wide a variety of people as possible (whether fellow scientists, policy makers, or individuals). In this talk, I will reveals the magic behind the Artificial Intelligence of Forza Motorsport and the machine learning algorithm Trueskill that matches players in Halo 3 and other Xbox LIVE games. I will also explain how simple geometry and advanced high-school maths mixed with tons of imagination can lead to exciting new possibilities in the realm of computer games and beyond. I will present the different types of intellectual property and how those rights can be obtained. I will also discuss some of the factors Microsoft uses for determining whether potential intellectual property rights are worth protecting and when we may prefer instead to share our work openly. Finally, I will talk about some of the more common issues we encounter when collaborating with other people or using materials created outside the company. Who is an intern at Microsoft Research? What do they do? Why should I apply for an Internship? These and other existential questions will be answered! Examples of recent Intern projects will give an insight into the variety and depth of work involved. In brief, Internships are a fantastic opportunity to learn more about research, learn about Microsoft from the inside, work with world-class researcher as mentors and colleagues, and have a great time. Lecture, Presentation or Conversation? We will examine: Who your audience is; What they want; Why you are addressing them; How you handle practical issues like nerves, body language, speech & voice, humour, visual aids etc. ; What is success? What is plan B if everything goes wrong; How you recover. What do the fundamental limits of physics say about sustainable energy? The British Isles, we often hear, have `huge` renewable resources – but we need to know how this `huge` source compares with another `huge`: our huge power consumption. The public discussion of energy policy needs numbers, not adjectives. Assuming no economic constraints, assuming we cover the country with windmills and the coast with wave-machines, every roof with solar panels and every field with energy crops, could Britain get enough power from renewables to continue with our current consumption? Simon Peyton Jones, MA, MBCS, CEng, graduated from Trinity College Cambridge in 1980. After two years in industry, he spent seven years as a lecturer at University College London, and nine years as a professor at Glasgow University, before moving to Microsoft Research in 1998. His main research interest is in functional programming languages, their implementation, and their application. He has led a succession of research projects focused around the design and implementation of production-quality functional-language systems for both uniprocessors and parallel machines. He was a key contributor to the design of the now-standard functional language Haskell, and is the lead designer of the widely-used Glasgow Haskell Compiler (GHC). He has written two textbooks about the implementation of functional languages. More generally, he is interested in language design, rich type systems, software component architectures, compiler technology, code generation, runtime systems, virtual machines, garbage collection, and so on. He is particularly motivated by direct use of principled theory to practical language design and implementation – that’s one reason he loves functional programming so much. He is also keen to apply ideas from advanced programming languages to mainstream settings. When labelled training data is plentiful, discriminative techniques are widely used since they give excellent classification results. However, hand-labelling of data can get expensive, and there is considerable interest in semi-supervised techniques based on generative models. Although the generalisation performance of generative models can often be improved by ‘training them discriminatively’, they can then no longer make use of unlabelled data. In an attempt to exploit the benefits of both generative and discriminative approaches, methods have been proposed which interpolate between these two extremes by taking a convex combination of the generative and discriminative objective functions. In this article, we consider that there is only one correct way to train a given model, and that a ‘discriminatively trained’ generative model is fundamentally a new model. From this viewpoint, generative and discriminative models correspond to specific choices for the prior over parameters, which opens the door to principled ways of interpolating between generative and discriminative extremes through alternative choices of prior. We illustrate this framework on semi- supervised learning. As part of her BSc, Julia spent a year in Ireland where she was introduced to machine learning for the first time. After graduation, she moved to Paris to complete a MSc in artificial intelligence and learn more about machine learning. She then came to Cambridge in 2004 to start a PhD on bayesian statistics and computer vision. She now works for a bio-informatics lab at the Max-Planck Institute, applying machine learning techniques to DNA analysis. Alban Rrustemi came to Cambridge in October 2003 to read for Diploma in Computer Science. He was awarded a Microsoft Research PhD scholarship in 2004. He conducted his PhD research at the Computer Laboratory, University of Cambridge, under the supervision of Dr Simon Moore and Dr Ken Wood. Prior to joining an industrial project in early 2009, Alban has been working in a number of research projects at the Computer Laboratory and at Microsoft Research in Cambridge. Alongside, he is involved in a number of charities in the UK and abroad. In 2005 Brian Amberg achieved a masters degree in Computer Science (Dipl. Inf.) at the University of Freiburg (Germany) with a minor in Cognitive Science. In his master thesis he developed an optical flow algorithm for volume data. Since then he works as a PhD student at the University of Basel (Switzerland), creating a system for expression manipulation in video streams. While completing his master studies he aquired experience as a professional programmer working for a medical imaging company. Additionally he tutored at the university and gave courses on the ruby programming language. His research focuses on computer graphics. His interests include practical effects of the perception of synthetic or manipulated images as well as advancing the understanding of human cognition with the help of artifical systems. An affinity to dynamic languages has made him an active member of the ruby community, where he contributed some libraries. Christoph Rhemann is a PhD student at Vienna University of Technology. He is currently working together with Margrit Gelautz, Carsten Rother (Microsoft Research) and Michael Bleyer in the field of computer vision with a focus on image segmentation and matting. His work was published at several international computer vision conferences including CVPR and BMVC. Mathieu Verbaere started to work on refactoring during his MSc in computer science at Oxford University. After a year in Paris working further on code analysis in industry, he returned to Oxford for a PhD on a scripting language for refactoring. He now works at Semmle where he leads the design of the novel object-oriented query language .QL, and products built with it related to software analysis. Jack Lang is a serial entrepreneur and business angel with high-tech and internet companies based in Cambridge, where he is Entrepreneur in Residence, Centre for Entrepreneurial Learning, at the Judge Business School, University of Cambridge, an affiliated Lecturer and member of the Faculty Board at the Computer Lab and a by-fellow of Emmanuel College. His latest venture is as co-Founder of Artimi, which is making the next generation of ultra wide band wireless chips. Previously he was founder of Netchannel Ltd, an early Interactive TV company which was acquired by ntl: where he became Chief Technologist. Before that founder of Electronic Share Information Ltd, one of the first online brokerages, acquired by E*Trade Inc. Prior to that he started a consultancy (now SAIC UK Ltd) that was involved in the early days of the “Cambridge Phenomenon”, and was a proper academic at the Computer Lab. He is author of “The High Tech Entrepreneurs Handbook” (FT.Com/Prentice Hall 2001). He has other interests in molecular gastronomy and fireworks. Chris Bishop is Chief Research Scientist at Microsoft Research Cambridge, and Professor of Computer Science at the University of Edinburgh. He is also a Fellow of Darwin College Cambridge, a Fellow of the Royal Academy of Engineering and a Fellow of the Royal Society of Edinburgh. His research interests include probabilistic approaches to machine learning, as well as their application to fields such as computer vision and biomedical science. In 2008 he presented the prestigious Royal Institution Christmas Lectures, broadcast at prime time on UK national television. Computational modelling of biological systems is becoming increasingly important in efforts to better understand complex biological behaviours. ‘Executable Biology‘ is a pioneering approach focused on the design of executable computer programs that mimic biological phenomena. While traditional mechanistic models in biology are usually described by diagrams (giving a fairly static picture of cellular processes), executable biology seeks to translate such static diagrams into dynamic models using formal computational methods that were originally designed for the construction and analysis of complex man-made systems (e.g., computers and computer programs). In this talk, I will illustrate the usefulness of this framework through our group’s efforts to use Boolean Networks, Process Calculi, Live Sequence Charts, and Interacting State Machines to model signalling pathways governing normal animal development and disease, organogenesis, and immunodominance. If time permits, I will also highlight some of the main challenges that executable biology poses for Biology and Computer Science. Jasmin Fisher is a Researcher in the Computational Science Lab at Microsoft Research Cambridge. She holds a Ph.D. degree in Neuroimmunology from the Weizmann Institute of Science and was previously (2003-2004) a postdoctoral fellow in the department of Computer Science at the Weizmann Institute, where she worked with Prof. David Harel, and then (2004-2007) a postdoctoral researcher in the School of Computer Science at the EPFL working with Prof. Tom Henzinger. Her research focuses on the applications of formal methods to biological modelling, as well as on the development of novel formalisms and tools to better understand complex biological systems. She is mainly interested in processes of cell fate determination and signalling networks operating during normal development and disease (e.g., cancer, diabetes, obesitiy). How a range of diverse features may be unified as instances of the general idea of refinement types. How a static checker for the Oslo modeling language M allows us to check for security errors in server configurations; intended constraints on configurations are expressed with refinement types, so that configuration validation reduces to type checking. How we statically check integrity and secrecy properties of security critical code, such as an implementation of the CardSpace security protocol, using a system of refinement types for the F# programming language. Andy Gordon is a Principal Researcher at MSR Cambridge. His research interests are in the general area of programming languages. His work at Microsoft has involved applying type theory and other formal techniques to problems of computer security. His projects include the following: an analysis (with D. Syme) of the type system underlying the bytecode verifier of the Microsoft .NET Common Language Runtime; Cryptyc (with A. Jeffrey), a type-checker for cryptographic protocols; and the Samoa Project (with K. Bhargavan and C. Fournet) on formal tools for the security of XML Web Services. He is currently excited about the many possibilities of refinement types, and is actively developing them in the context of both F# and the Oslo Modeling Language M.
For many important research investigations, especially in science, efficiently analyzing large data sets is a major challenge. Microsoft’s Dryad is a high-performance, general-purpose distributed computing engine that handles some of the most difficult aspects of cluster-based distributed computing. It’s powerful: Microsoft routinely uses Dryad applications to analyze petabytes of data on clusters of thousands of computers. Microsoft Research has also developed DryadLINQ, which allows developers to use an extended version of the LINQ programming model and API to implement Dryad applications in managed code. DryadLINQ code is similar to what you’ll see in a conventional LINQ-to-objects application, and the application core is often only a few lines of code. Behind the scenes though, a DryadLINQ provider automatically converts the LINQ query into a Dryad job and executes the query as a distributed application on a cluster. Using Dryad through DryadLINQ, even a novice at parallel processing or cluster-based computing can implement a high-performance distributed application to efficiently analyze terabytes of data. In this talk we present an introduction to Dryad and DryadLINQ for data intensive research and we compare and contrast it to other related technologies. We describe our ongoing efforts to collaborate with external researchers to explore the application Dryad and DryadLINQ to big data research problems in science. We also highlight our efforts to offer software and services to researchers across the world, through the academic release of Dryad and DryadLINQ with associated programming user documentation. Roger Barga is Principal Architect at Microsoft Research, where he leads the Advanced Research Services and Tools (ARTS) team. The ARTS team is responsible for developing innovative tools and services using Microsoft products and technology to revolutionize and accelerate research, and it provides strategic and tactical hands-on technological leadership to many research projects. Roger joined Microsoft in 1997 as a Researcher in the Database Group of Microsoft Research, where he directed both systems research and product development efforts in database, workflow and stream processing systems. He has developed ideas from basic research, through proof of concept prototypes to incubation efforts in product groups. Roger has published over 50 peer reviewed papers, filed over 30 patent applications, and served more than 70 times on program committees for more than 30 different international conferences and workshops. Yan joined Microsoft Research in March 2006. Her research has been focused on exploring technologies and pedagogical strategies that facilitate and enhance interdisciplinary computational research and education. She is responsible for the WorldWide Telescope Academic Program, which enables collaborations with academic researchers and educators in computer science and astronomy; the Transform Science–Computational Education for Scientists initiative, which enables collaborations with academia for infusing computational thinking into science education to create tomorrow’s scientists; and the Phoenix Academic Program for applying Microsoft Phoenix technology to computer science research and education. Prior to working at Microsoft Research, Yan was a Sr. Software Architect and worked for several startup software companies for over ten years. Yan received her Ph.D. in Physics from McGill University, Canada. After receiving an undergraduate degree in computer science from Leuven, I started a Master’s degree at the University of Wisconsin where my research was focused on applying statistical machine learning techniques to problems in natural language processing. 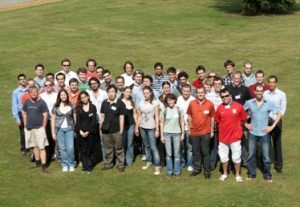 In 2007, I joined the machine learning group at the University of Cambridge where my research shifted to developing new algorithms and techniques for probabilistic modeling. More recently, I have been involved in a project to build a tool that makes probabilistic machine learning more accessible to the data mining community. Since the start of my PhD I have been actively contributing to dnAnalytics: an open source numerical library for the .NET platform. Tennie Videler is a programme manager for Vitae, an organisation set up to support postgraduate researchers and research staff. Before that she was a researcher herself, completing a PhD and a dozen years of post-doctoral research in different fields of structural biology. Tennie joined Vitae last year and is the person dedicated to making contact with researchers, both postgraduates and research staff. She writes and commission resources for researchers and attend events where she meets researchers and staff who support them. She is also involved in some research, such as the latest issue of ‘What Do PhDs do?’ on the first employment destinations of PhD graduates, which is currently underway. Tim Harris is a researcher at Microsoft Research Cambridge (UK) where he works with the Cambridge Systems & Networking Group, the Programming Principles and Tools Group, and the BSC-Microsoft Joint Research Centre. His main research interests are in the design and implementation of programming languages and managed runtime environments to support multi-threaded and multi-processor software. James Scott is a researcher in the Sensors and Devices group at Microsoft Research Cambridge, UK. He joined Microsoft in January 2007. He previously spent four years as a researcher at Intel Research. His PhD, at the University of Cambridge, was supervised by Prof. Andy Hopper. His research interests span a wide range of topics in ubiquitous and pervasive computing, and include novel sensors and devices, mobile interaction, wireless and mobile networking, energy management, and security and privacy. He has authored over 30 peer-reviewed publications and has served on the PCs of leading international conferences such as UbiComp, MobiSys and Pervasive, and was recently PC chair for UbiComp 2008. Drew Purves studied ecology at Cambridge University, did a PhD in ecological modelling at the University of York (UK), and spent nearly 6 years as a postdoc in the EEB Department at Princeton University, before joining MSR Cambridge in 2007. Purves’ work, which focuses on the dynamics of populations and communities of plants, especially forests, has been published in a number of top-tier scientific journals including Science, PNAS, and Proc Roy Soc B. Dr Purves co-supervises several PhD students at European universities, and is an affiliate lecturer at Cambridge University. Ralf Herbrich is a Senior Researcher at Microsoft’s computer science research lab in Cambridge. In his work, he and his team combine cutting-edge research in computational intelligence and machine learning with their passion for computer games and the Internet. Ralf has co-authored over 50 peer-reviewed publications in machine learning, optimization, probabilistic modelling, learning theory and game AI. After graduating from George Washington University law school, John worked in private practice on patent litigation, patent prosecution, clearance opinions and licensing. He and his family moved from Washington DC to Redmond to join Microsoft in 2004 where he worked on the patent analysis team. He then took on his current role providing legal support for Microsoft Research in Cambridge, innovation centers in Germany and Egypt, and other offices in Europe, the Middle East and Africa. Peter Key joined Microsoft Research’s European Research Centre in Cambridge, U.K., in 1998 where he is a Principal Researcher, co-leading the Systems and Networking area. He also acts as Intern Tsar! His current research is on multipath routing in wired and wireless networks, home networking, and the economics of networks and of ad-auctions. His other research interests include Distributed Control, Application Performance, Quality of Service and Stochastic Networks. Prior to joining Microsoft, he was at BT, working in the field of Teletraffic Engineering and Performance Evaluation, where he was involved with the development and introduction of DAR (Dynamic Alternative Routing) into BT’s trunk network. At BT he led a mathematical services group, and 1992 ventured in to ATM to lead performance group. In 1995 he led a Performance Engineering team and then managed the Network Transport area. He is a Visiting Fellow at the Statistical Laboratory, Cambridge, and a Fellow of the Institution of Engineering and Technology (FIET). In 1999 he was Technical co-chair of the 16th International Teletraffic Congress (ITC) , and Program co-chair for Sigmetrics 2006. Ken Shaw has taught communication skills to MBA students at Judge Business School for 17 years. He has also taught at Said Business School, London Business School, Cass Business School, Henley Management College, ESMT in Berlin, Bled School of Management plus Leicester, Nottingham and Bristol universities. He has delivered training for commercial clients in France, Germany, Switzerland, The Bahamas, Holland, Norway, America, The Caribbean, Australia and Singapore. What do the fundamental limits of physics say about sustainable energy? The British Isles, we often hear, have ‘huge’ renewable resources – but we need to know how this ‘huge’ source compares with another ‘huge’: our huge power consumption. The public discussion of energy policy needs numbers, not adjectives. Assuming no economic constraints, assuming we cover the country with windmills and the coast with wave-machines, every roof with solar panels and every field with energy crops, could Britain get enough power from renewables to continue with our current consumption? David MacKay is a Professor in the Department of Physics at the University of Cambridge. He studied Natural Sciences at Cambridge then obtained his PhD in Computation and Neural Systems at the California Institute of Technology. He is internationally known for his research in machine learning, information theory, and communication systems, including the invention of Dasher, a software interface that enables efficient communication in any language with any muscle. He has taught Physics in Cambridge since 1995. Since 2005, he has devoted increasing amounts of time to public teaching about energy. He is a member of the World Economic Forum Global Agenda Council on Climate Change. What challenge is being addressed or question being answered by the research in such a way that a non-expert can understand the importance of the research. What the intended outcome is. What stage it is at. Any research results, preliminary conclusions, or any potentially exciting or interesting next steps are. Posters should be aimed at other students and researchers who do not necessarily have expertise in that specific area of research. Posters should also clearly display your name and the name of your university. You can find example of posters on the page of the 2008 Summer School.